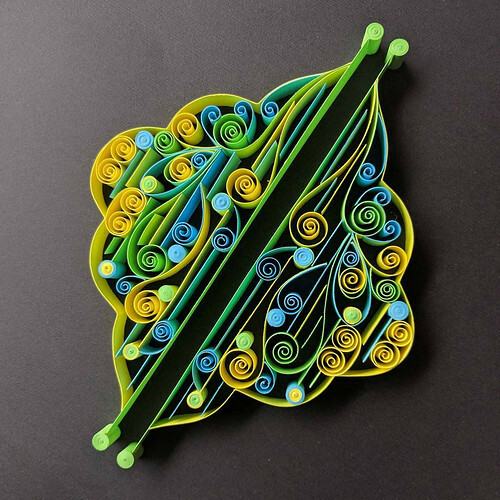 Perhaps I shouldn't generalize and call the paper art home decor that Archana Kumar of Tealcup creates, quilling... you see, she is as adept at devising linear, geometric pieces as ones that are composed of tiny rolled coils. 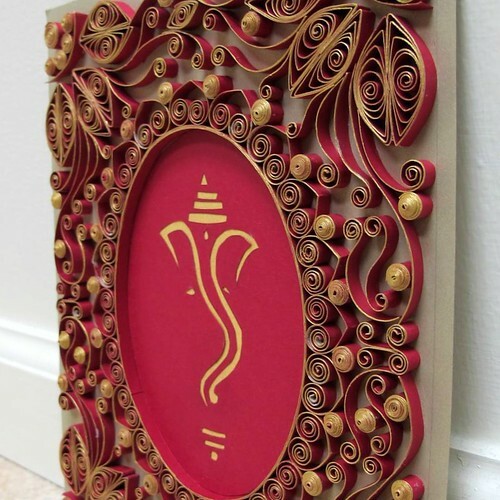 Traditional quilling is where Archana got her start though, so I'll let the post title stay as is. We met via Instagram (@thetealcup) when she alerted me to a photo she had snapped of large scale quilling in an Anthropologie window. It only took a quick glance at Archana's feed to know I wanted to share her work here... you see, as one who loves small collections, all things orderly and creative color palettes, it spoke to me immediately. Despite being a busy student, Archana agreed to answer my questions about her artistic journey. From your Instagram captions, I understand you've been quilling for about five years as a hobby and you are a full-time student. 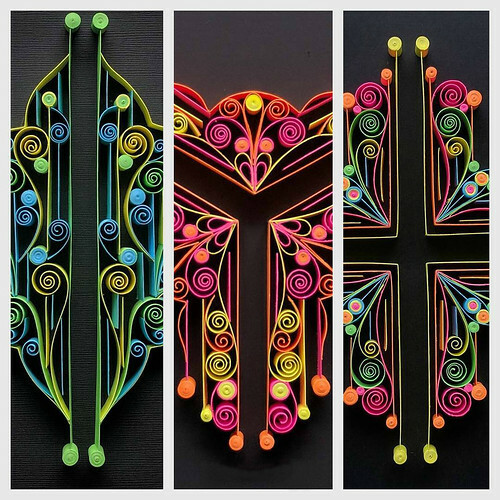 What prompted you to begin quilling? 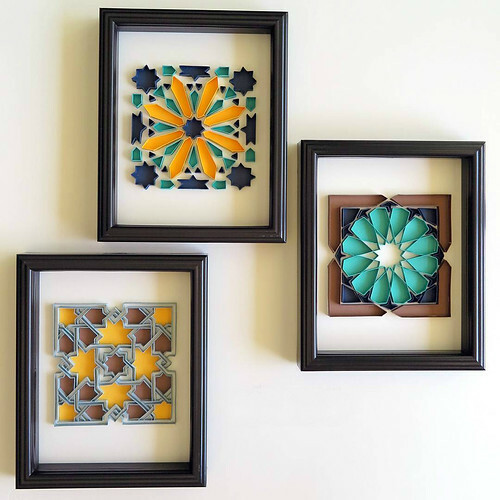 I admire the way you create cohesive series of three framed works in a certain color palette, inspired by art objects. 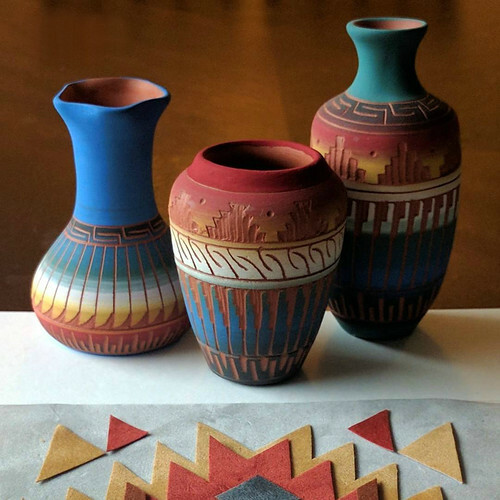 Your Tribe Series, for example, was inspired by Native American earthenware. Yes, I have been doing sets of three pieces in the same theme, color scheme and dimensions. I think this allows me to explore the idea in greater depth and experiment with the variations a bit. Also, they look nice displayed as a set on my walls! 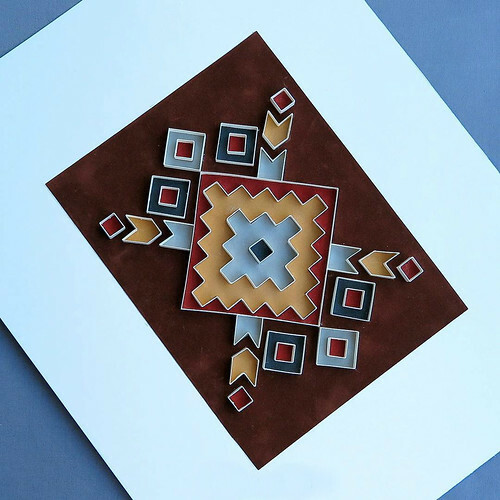 What do you especially like about the process of creating on-edge paper art? I like how a finished piece takes on a complexity that is far more than the sum of its parts. 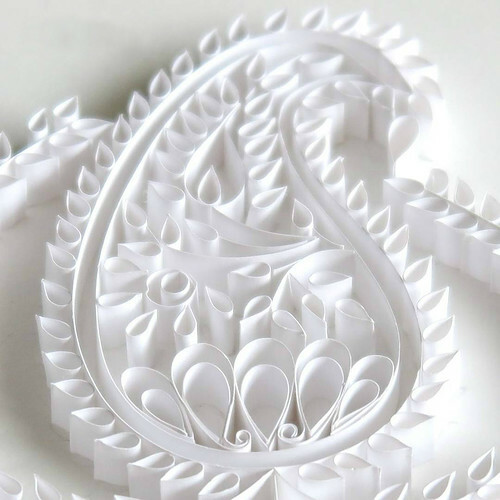 If you break it down, it is not very difficult to coil a single piece of paper, but assemble a few of them together in some form, and they look much more intricate and impressive. Also, once you have figured out what you want to do for a piece, the execution of it is often a repetitive process that takes patience and perseverance. I find that calming and soothing. Do you have a favorite tool and type/width of paper? I use a needle tool most often. Lately, I’ve been using it to condition the paper multiple times, and then re-roll it only with my fingers to get an extremely tight coil center with no gap. 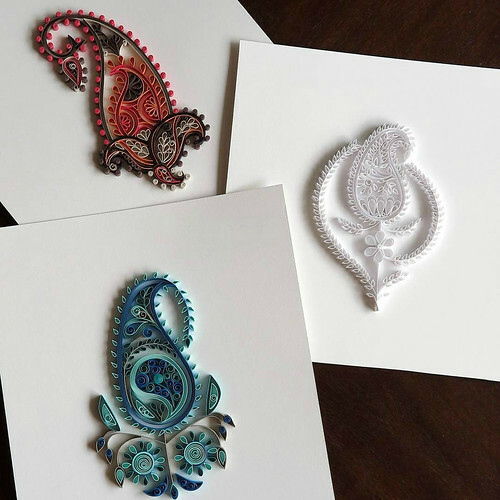 I prefer to use pre-cut quilling strips if I need lots of curls and swirls, and card stock if I need a bit more structure or completely straight lines. I’ve also found it easier to get card stock to match a specific color palette I have in mind for a project. I use a scrapbook paper trimmer to cut card stock strips. I’ve mostly used ¼” strips so far, with only my Neon series made of ½” strips. I’m hoping to experiment more with various widths in future pieces. Are you proficient in other types of art/craft? I have dabbled in many other types of art/craft in the recent past (ceramics, polymer clay jewelry, adult coloring books, things involving Mod Podge, acrylic paint, etc.). But overall, I’ve preferred to give one or two skills enough time and effort to get really good at it. Currently, apart from quilling, the other hobby I’m semi-serious about is ceramics. 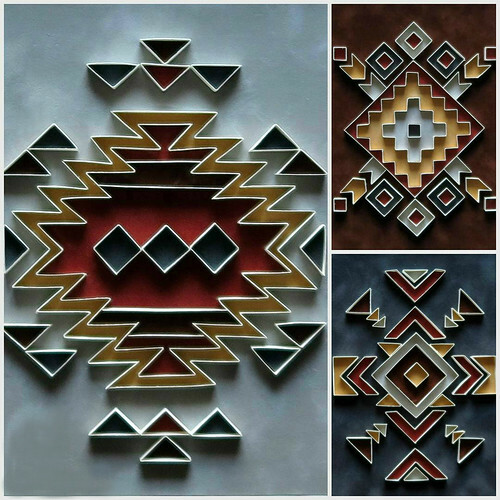 One of your earliest pieces was a nod to antique quilling and inspired by Inna Dorman. You mentioned hand painting a gold edge on the strips with acrylic paint... I'd love to hear more about the method you used to achieve such a nice look. The strips were cut from card stock using a paper trimmer. I then used a brush (or even my finger sometimes) to lightly dab gold acrylic paint on the strips one at a time and let them dry on a sheet of newspaper. Once they were fully dried I rolled them normally. I found that painting the edges before rolling makes the edges look more distinct. Painting after rolling tends to obscure the edges and make it look more “solid”, especially on tighter coils. Thanks so much for taking time to tell us about your work. One last question... do you have a new series underway? I’m currently on a brief hiatus from quilling as I’m focusing my spare time on my thesis and trying really hard not to procrastinate! My list of quilling ideas is overflowing though, and I’m looking forward to getting back to it soon. Also, as of now, I create for the sake of creating and I’m not selling my work or taking any commissions, but that may change in the future. If it does, I’ll update on Instagram. Beautiful works. Thank you for highlighting and interviewing the artist. It's great that the work is noticed and appreciated.Abstract art is an ultimate way to meditate and develop creative skills.